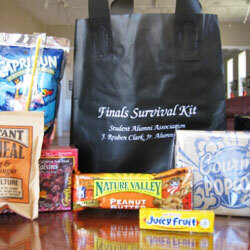 Brighten your student's day during this stressful time by ordering a Finals Survival Kit! Each Survival Kit contains scantrons, a note from you and goodies such as: candy bars, chips, punch, popcorn, oatmeal, granola bars, ramen, gum, candy, crackers and dried fruit. Your student's kit will be delivered by the Student Alumni Association or arrangements will be made for pick up at the SUU Alumni House. For Fall Semester 2018, the online order deadline is Friday, November 30 at 5 p.m. Go to the Online Store to order a kit. Designed to brighten your student's day, our care packages are complied with some of students' favorite treats that SUU Dining offers. Surprise your student on a bad day, on their birthday, or on a big exam day; care packages are morale boosters and are sure to bring a smile to your student's face (and stomach). Start their semester off strong by stocking them up on some essentials and treats! Big test coming up? Give their brain a boost! Who doesn't like a box full of treats? Give them a special treat on their special day! A written message (ex. "Happy Birthday Trevor" or "Happy 19th Natasha! ").